Our Elfa Mesh Closet Drawers have room for it all. The solution includes one 1-Runner Mesh Drawer, three 2-Runner Mesh Drawers, a Melamine Top and Back Stop Pins. The fine weave of the mesh prevents small items from falling through. We offer a variety of Drawer Accessories that you can add to customize your solution. Elfa is an entirely customizable system - if this isn't exactly the solution you're looking for, try our Elfa Drawer Planner. White Elfa Mesh Closet Drawers is rated 4.8 out of 5 by 91. Rated 4 out of 5 by ClosetConqueror from Pretty good This product is a great idea with a couple of design issues that would be very easy to correct. The first, the instructions for putting it together are essentially non-existent. It’s not hard but knowing the top from bottom would be helpful and understanding the pegs to stop the top drawer really can’t be put in at the end (won’t fit) and using a mallet to build it makes them pop out. Another thing, the top is held on by little stickers...the top is not secure. They went cheap for no reason here. Rated 4 out of 5 by JayS503 from Good but not perfect This is our second set of elfa closet drawers. Love their flexibility, and that they fit in our closets. Flaws: the top covers are not exactly the same width as the drawer frames. So, when using multiple frames side by side, we had to choose between having gaps or ending up with tops that don’t line up with the frames. See picture. Also, the bottom seams of the wire mesh drawers are rough on many of our drawers. We’re a little worried about clothes getting snagged. Finally, I didn’t bother getting the label holders this time, because they always fall off. Although advertised as working with the mesh drawers, they don’t have any way to latch on securely. Rated 4 out of 5 by Xanthepe from Nice drawers Nice product, roomie for extra drawer space. Although they did not come with assembly instructions that was a bit frustrating. Rated 5 out of 5 by MarTra from Perfect for what I needed I just added shelves to our back closet and I wanted to make the most out of the vertical space I had and purchased these closet drawers and they are perfect! Rated 5 out of 5 by Kella703 from Awesome Drawer Units Got rid of the dressers and installed 2 of these platinum units in with the melamine tops in my closet. The drawers are great, easy to find what I’m looking for and the platinum is a great color. I use the 1 runner on top and 2 runners at the bottom. I fold my clothes the Kondo way - it really works well! Rated 5 out of 5 by riShells from ELFA 4-Drawer Unit- Perfect Fit The construction of my new home is almost completed. I needed a small cabinet with drawers to finish up the pantry. There was just enough room left in there to fit in the 4-drawer ELFA unit. It serves its purpose well affording me the extra storage convenience of having drawers instead of open shelves. Rated 5 out of 5 by DevinD97 from Great for College I purchased these drawers to go under my bed in my dorm Freshman year. They have worked great! They are so durable and they fit perfectly underneath. I have two sets. People are always asking me where I got them when they see them in my room. They are also pretty aesthetically pleasing compared to a lot of storage, so I do not mind that they can be seen under my bed. Rated 5 out of 5 by RoboWarrior from Great product for college Students First of all I have to note that I created the elfa drawer system using the Custom Drawer Planner, so I don't have the exact drawer system shown above. I am a college student living in the ever so popular college dorm and this product has been my bed side table for the past year. I would have to say that as of right now I could not live without it in my dorm room. They quality of the material is excellent, it is able to hold numerous heavy textbooks with no problem. Also I have found out the it work great to stand on in order to reach high places in my dorm room, so i would have to say that it is pretty strong as well. My only complaint with the product is that it is a bit hard to take down or break apart when moving the shelf from place to place or house to dorm room. Rated 5 out of 5 by TXnCutie82 from Will buy again I love the quality and ease of this product. The instructions weren't the best (some vague pictures on a box), but I made do quite easily (but note, if assembling, you'll want to add the nail-looking things [drawer stops] prior to putting the top on). I will definitely be buying buying another one as I got rid of my dresser when I moved into an apartment with a huge closet. I haven't quite been able to get the wooden top attached to the frame, but I'll figure it out one day. Rated 4 out of 5 by real from best purchase It looks and fits so nice in my closet. very organized and useful product. Rated 4 out of 5 by TravelTheWorld from Good, but experienced some fit issues Once assembled, the height is good, the drawers are useful sizes and the drawers slide in and out with ease. The problem I ran into however, was getting the top L-crossbars to fit into the side panels. The fit seemed to be off - one of the two were either too big or too small. Despite my husband and I hammering away at it with a rubber mallet for 30 minutes, we could never get one of the crossbars to fit into the side panel. Bringing everything back to the store would have been a hassle, so we made do. We had purchased two of these units and both of them seemed to have the same fit issue. Rated 5 out of 5 by Dcshults from Love Elfa Closet Drawers Love, Love my Elfa closet drawers! I have one to two in every closet. Fabulous! Very sturdy. They last forever! I have three that have endured three college students. Rated 5 out of 5 by lady123 from FABULOUS CLOSET ACCESSORY The platinum mesh drawers are perfect for use holding dirty clothes in a walk- in closet. It fits nicely under the upper rack holding the shirts. I also like that the mesh is tightly woven so you can't see the contents. The three large drawers are the perfect size and can hold bulkier items like jeans. The three drawers allow you to sort the clothes: whites, colored and bulky items.The thinner drawer at the top is perfect for a man to throw his wallet, watch, spare change and whatever else he has in his pockets along with room for holding clean handkerchiefs. The drawers remove easily to take to the laundry room. I have used another brand of closet organizer but after discovering elfa, I would never go back. The quality, the look and the accessories that are available make it a far superior product line. Rated 5 out of 5 by Ruppansy from Excellent quality purchase and easy to assemble I love these drawers. They are easy to purchase, just as easy to assemble and come in a perfect range of sizes. I bought 4 sets of different sizes 7 years ago. They are still in great shape and I recently bought 3 more to fit into a new space. Highly recommend! Rated 1 out of 5 by 765987 from Disappointed Drawers do not stay on track. I've remounted them (all 6) over and over, but they don't stay on track. They were professionally installed, too. Rated 5 out of 5 by crenee from fabulous art work area. love how these units go together and form a large work area, for me to paint..the drawer hold a huge amount of supplies, ease to access. Rated 5 out of 5 by BigSpenderIA from Sturdy drawer unit Got the Elfa drawer system with 5 drawers on sale for my closet. Very nice quality and very sturdy. Well made melamine top and mesh drawers, will last for a long time. Lots of clothing and accessories now fit in my closet thanks to this one drawer unit. Was hesitant to order without having a store near us - but saw it in some organizing videos online and really felt confident ordering off of the website and getting it shipped to me. Rated 5 out of 5 by Rleigh from Love it!! This is my favorite piece in the closet. Drawers slide effortlessly. Spacious and see through so you don't have to search blindly. Rated 5 out of 5 by Jenny5 from Best fix for closet organization I absolutely love this product! This is the way to maximize your closet space with doing almost no work! I never knew what to do with the smaller things - they always seem to get lost in a sea of things in my drawers. These differently sized units allow me to locate my things in instant and stay organized! Rated 5 out of 5 by ElizS from Best drawer systems! 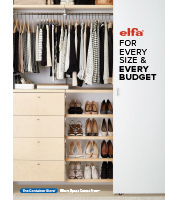 The Elfa closet drawers are the perfect tool for anybody to get clothing and other items organized in a closet. Whether you are new to getting organized and need as much help as you can get, or if you are an organizing queen like me, this is the perfect tool. Drawers come in a variety of sizes for every possible use, the mesh is a perfect solution to getting a handle on small items and keeping them in place, and this is attractive stuff. I love it and have it in every closet. Rated 5 out of 5 by Bobbey34 from Terrific storage The elfa Mesh Closet Drawers have been the answer to our storage. After buying the first set, we purchased 2 more sets. elfa products are sturdy, can be purchased in different sizes and fit perfectly in closets. The melamine top creates another shelf. The mesh prevents items from falling through and the different sized drawers make the sets very usable. The sets are worth the price. I have used drawer sets made of plastic hat do not stand up under weight and usage. elfa products are made of quality materials. We made a few mistakes in assembling the framework. need to really pay attention to the very clear directions in the booklet. Rated 5 out of 5 by MamaK from Nothing compares to Elfa! I love the elfa drawer systems. I first bought them when rehabbing my kitchen to store everything that was in my cabinets during the transition. It was great having it on wheels to roll around during construction. Afterwards, we repurposed the drawers and used them in the garage. Now my husband loves them too. From there our desire for more elfa drawers grew! We have several more in the garage now, and I have elfa drawers in all my closets. They are great for deep closets - you never lose things in the back of the closet. I think my favorite is storing all my shoes in 5 elfa 2-drawer systems that line the bottom of my closet. No more digging for shoes, and it never gets messed up! Elfa is light weight - even I can assemble, but very strong and durable so it works in the garage too. Elfa has made my life easier and saves me time by keeping things organized. My favorite! It's the first place I go when looking for storage options. I've looked for comparable products at the big hardware stores, but it doesn't exist. Now I don't waist my time - I just buy elfa. Rated 5 out of 5 by AliciaB from Making Life Easy! I LOVE elfa drawers! They have maximized the vertical space in my closet allowing me to easily access the treasures stored in my closet. I forgot some of the things I had back in the corner, but now I see them everyday when I pull out the drawer. My only wish is that my closet was bigger so I could have more elfa! Rated 5 out of 5 by Midge1963 from Best solution for all of my husband's t-shirts! My husband has a ton of colored t-shirts that he wears under v-neck sweaters. They were stacked in his closet and when he would select one the entire pile would fall over causing a mess and making it difficult for him to find the shirt he wanted (and making me annoyed with the mess created!) I found an amazing solution with elfa. I customized this drawer unit with seven drawers. I then rolled each t-shirt, putting them in the drawers in a single layer in color order. My husband now can pull open a drawer, and take out the exact shirt he wants without disturbing the rest. My husband, who is not someone who normally cares about organizing the way I do, was very impressed with this solution. Elfa solved a problem for us and I highly recommend it for any of those annoying areas around the house that you need to organize. I have elfa in my garage, my laundry room, bathrooms, pantry and our closets. I love this product and its versatility! Rated 5 out of 5 by Jen333 from Great option to use closet space well I have this drawer set and put it in my closet to sit under my hanging shirts that are on a bar - it fits perfectly and allows so much extra storage space in the small closet for folded items like sweaters and PJs. Really helped me make the most out of the space! Rated 5 out of 5 by MyOrganizedSelf from Coming Back for More I will definitely invest in more of these drawers! Are the drawers removable once the system is assembled? How tall are the drawers? I prefer all short drawers but this looks like it has deep drawers. There are different sizes. Container Store gives you dimensions for all drawer sizes. Does it come with elfa Frame Feet? Yes, but you have to purchase plastic covers if you want a covering over metal feet. Do the mesh drawers leave marks on clothing? I have not found drawers to leave marks but the mesh can catch and snag clothing if using for clothes. Depends on drawer system's dimensions. But very sturdy. Heavy enough ( but not very heavy) to not move around under cab when opening drawers. How do I attach the melamine top? Does the melamine piece just sit on top of the shelving unit? Is there nothing to secure it in place? Stickers! This is the biggest mistake in the design. It&rsquo;s fine sitting in my closet but have to make sure when it&rsquo;s moved that the top is not secure. Can the larger drawers be used for files? If so do additional parts need to be purchased? Yes! Create hanging file storage in an elfa Drawer unit with our elfa Drawer File Channels. Add them to a 3-Runner Drawer (Medium for letter-size files or Wide for legal-size files) to instantly create hanging file space inside a drawer. I would like to stack them. Is there a way to do that? Yes, our elfa drawer units can be stacked using the crossbars.